I welcome you to explore the information on this site, and the websites it links to, on your journey to good health. Over 30 articles on a wide range of health topics, with a focus on how diet affects our health. 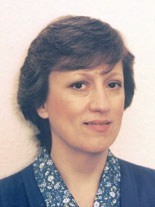 A blog containing information on diet, nutrition and health. Some useful videos on subjects such as why you may not be able to lose weight, all about the Stone Age Diet, and how to make low-carb bread. 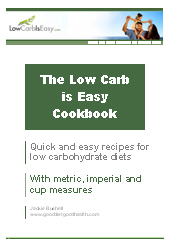 A selection of resources help you to evaluate whether a low carb diet is suitable for you, plus diet and menu plans, a guide to low carb diets and an innovative low carb cookbook. Information about how to lose weight and some of the factors that may be preventing weight loss. 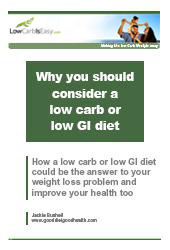 "Why You Should Consider a Low Carb or Low GI Diet"
A free e-book explaining why a low carb or low GI diet may not only be more effective in helping you to lose weight, it may also be better for your long term health too. 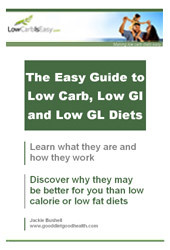 "Easy Guide to Low Carb, Low GI and Low GL Diets"
A quick and easy guide to all you need to know about how low carb, low GI and low GL diets differ from the conventional low calorie/low fat diet and the science behind them, how to choose the best diet for you, how to do your chosen diet and tips for getting started. Our 14-day menu plans for Atkins induction and other low carb diets, and 21-day low GI and GL diet menu plans are ideal for helping to keep you on your diet. Designed by an experienced dieter, the menus are all original and help you expand your ideas of how you can eat on carbohydrate-restricted diets without falling into the boredom trap. A cookbook for those following Atkins, LCHF (low carb high fat) and other low carb, low GI (glycemic index) and low GL (glycemic load) diets. The cookbook can be used in both conventional cookbook and 'recipe software' mode. Interactive online features include the ability to personalise your own ingredients and quantities, modify and create your own recipes, and access the saved recipes from anywhere in the world. 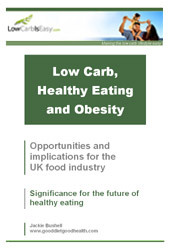 A report for the food industry on the opportunities and implications arising from the switch from conventional low calorie / low fat diets to low carb and low GI diets. 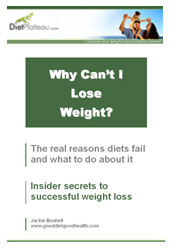 "Why Can't I Lose Weight - The Real Reasons Diets Fail And What to Do About It"
A comprehensive book which explains weight loss problems such as diet plateaus and depressed metabolism, and how to overcome them. Contains the top 15 reasons why people may not be able to lose weight, even when dieting and/or exercising. Relevant for anyone on a diet or thinking about going on a diet, whether low carb, low GI, low calorie, low fat or any other kind of weight loss diet. Following a Stone Age-style allergy or exclusion diet? 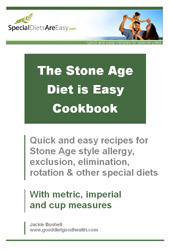 A cookbook for those following Stone Age-style allergy, exclusion, elimination, rotation and other special diets. All recipes are wheat free, corn free, soya free, gluten free and yeast free. Recipes for bread made with flours such as millet, buckwheat, tapioca, quinoa and gram flour are included.